In this game show, unsuspecting contestants, who think they're just hailing an ordinary cab, are given the chance to win cash on their way to their destination. All they have to do is correctly answer a few trivia questions before their ride is over. A team of contestants get a workout in the cab, Ben picks up a professional mentalist who tries to get inside his head, and Andrew Zimmern, of The Zimmern List, puts one groups culinary knowledge to the test. Two longtime friends make the ultimate mistake, a group of bar buddies take their best shot in the cab, and the Property Brothers, Drew and Jonathan Scott are back to help Ben quiz some lucky contestants. Ben puts two contestants in the hot seat with help of celebrity guest and host of Fast N' Loud, Richard Rawlings, best friends are reminded why you should always go with your gut, then the ultimate Cash Cab comeback. Ben puts a father and son team to the test with the help of special guest star Andrew Zimmern, of The Zimmern List, Ben experiences a Cash Cab first during a street shout out, and one rider receives the ultimate Birthday present. Blood is shed in the name of trivia when a contestant nearly breaks his nose in a moment of celebration, Man v .Food host Casey Webb makes a special guest appearance, and Ben makes dreams come true for two brothers who get their chance in the Cash Cab. A group of riders are put to the test by special guests, Drew and Jonathan Scott from "Property Brothers"; a couple from Long Island looks to social media for help; and a group of friends try and recount what they learned in school. Two brothers from Jersey brush up on their German and French History, a group of friends shake things up with a video bonus they'll never forget and two roommates are schooled on their heavy metal knowledge. Unassuming people enter a taxi cab as simple passengers taking a normal ride, only to be shocked when they discover that they're instant contestants. The driver/host, Ben Bailey, asks the passengers trivia questions as he escorts them to their destination. It's Shark Week in the Cash Cab! See what happens when Ben tests the nautical knowledge of a group of Sailors, Best Friends and a family of three as they try their luck in the Cash Cab. It's a bright day in the Cash Cab when two Rutgers University IT specialists are surprised by Murray Goldberg himself, Jeff Garlin. Then, comedian and star of Curb Your Enthusiasm, Susie Essman make the day of two players. Ben tests a family of three, and lucky for them Dad is in the answer seat. Then, a family from Boston is taken back when they're joined by Hollywood Icon, the wickedly smart and beautiful Brooke Shields. Three friends freak out when none other than Gilbert Gottfried joins their team. Then, if the cab wasn't loud or funny enough- Comedian Dave Foley surprises a Mom and Dad to be and lends a hand in the game. Four bartenders take a shot at their luck in the cab and see if they can make it all the way to work with no strikes. Then, a couple's ride is interrupted when none other than Matthew Perry jumps in wanting to share a ride. Two Virginians get lucky while in town and score a ride in the Cash Cab. Then, the most famous voice in showbiz, the hilarious Gilbert Gottfried joins a group of three high school buddies and help them on their way to victory. Things get physical when two rowdy brothers from Alabama test their luck in the cab and an unsuspecting couple is headed uptown when their ride is hijacked by celebrity, Scott Bakula. Will they leap to victory or get beamed right out of the cab? In a tragic story that seems right out of a "CSI" episode, a production taxi cab used in filming the popular mobile trivia quiz series "Cash Cab" struck and killed a man in Vancouver, British Columbia over the weekend, according to The Vancouver Sun. Lindsey Houghton, spokesman for the Vancouver Police Department, said that the unnamed 61-year-old man was struck by the "Cash Cab" on Friday evening, and was taken shortly thereafter to the hospital, where he died. 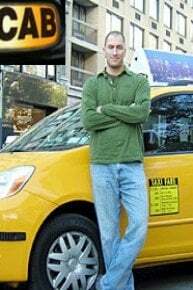 Cash Cab is currently available to watch free on Discovery and stream on Discovery Channel. You can also stream, download, buy, rent Cash Cab on demand at Amazon, Hulu, Vudu, FandangoNow, Google Play, iTunes online.